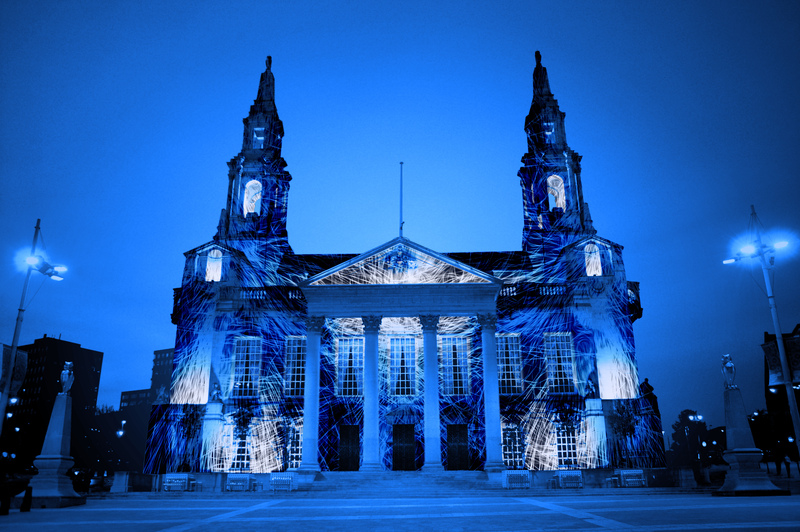 Following the much loved Momentous by Illuminos in 2013 Leeds Inspired are delighted to announce that Leeds based Omni Pictures will create a new projection, Theatre Of Illumination, to reimagine the front of Leeds Civic Hall into a vision of the future. Theatre Of Illumination will run for two nights on 2nd and 3rd October forming the centrepiece to the city’s Light Night celebrations on the Friday evening. Using sound collages, pattern driven visuals and optical illusions, Theatre of Illumination will propel the architecture of Vincent Harris’ neoclassical building into the next century through an ultramodern white light show. With the explosive energy of a firework display, audiences will experience a digital spectacle of light and sound. Will Simpson and Julien Lasson will create the visual elements of the commission, starting with the original architecture of the building, reinterpreting and animating it with geometric landscapes and magic eye style effects that take the audience on a futuristic journey of light. Lee J Malcolm and Tom Hopkins will compose an eclectic electronic soundscape from recordings of the city and its people, played in surround-sound in Millennium Square. This commission was awarded following an open call for proposals in April 2014.